I have been pretty horrible about keeping any semblance of a schedule with the Bel Folks Stuff podcast. Some months I release early in the month, and others I barely squeak out an episode before the month finishes. This month is definitely the later as with other events going on I struggled to find a good time for me to record this bonus podcast. I am extremely thankful that when I found a time my good friend Jaedia was gracious enough to make it work. What makes it even more special is the fact that Jae is recording rather late in the evening. It seems she doesn’t actually sleep, and might be some kind of new fangled android or something? Joking aside we had a lovely conversation about all sorts of random things. Since both of us have suffered with depression and anxiety for years, we touch a bit on that. We also of course talk about gaming and what we have been up to lately. We also get into the rules of how long you have to live in Wales before you have to start calling yourself “Welsh”. Jae is recently married so we talk a bit about the transition from living together to being “married” that we both went through. Jae at one point had five different blogs so we talk about the depths of her insanity and ability to compartmentalize. We also talk about the happy medium we have found with being a general interest blogger. It was a fun show to record and I hope a fun show to listen to as a result. Almost since launch folks have been foretelling the Doom of Wildstar, and not for lack of good reason. The game had extremely anemic launch numbers, and as was announced during the latest NC Soft earnings report its box sales had trickled to a slow drip. The current rumor mill of Wildstar going free to play was really spurred on by the announcement of their Mystery Box promotion. So yesterday when they announced that the game would be shifting to a free to play model, this should have surprised no one… not even the most die hard of pro-subscription Wildstar fans. While some Wildstar players are tending to wallow in the doom and gloom that comes with these sort of statements, I tend to view this as a potential new lease on life. For whatever reason gamers appetite for a monthly subscription is next to non-existent. Even World of Warcraft recently introduced the Token system allowing players to convert in game gold for subscription time much in a similar way to Eve Online does. This leaves the last pure bastion of the subscription game being Final Fantasy XIV… and I would not be shocked if we see them implementing some sort of gil to token system eventually. I am not saying the age of the subscription is over, but I think the age of subscription being the only option just might be. I personally prefer to pay a single monthly fee for “all you can eat” buffet access to the game. Some players prefer to try and play the game for free regardless of the restrictions. Others prefer to purchase features “À la carte” and quite frankly I think in the current gaming economy a game needs to support all three models in order for it to gain permanent traction. 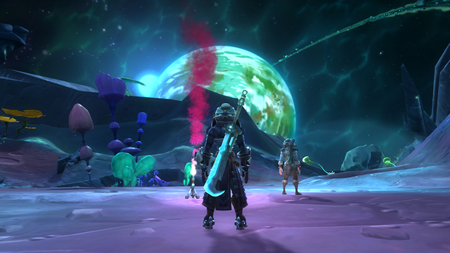 Wildstar I feel suffered from the same issues that Elder Scrolls Online did… namely that it launched during an exceptionally tight window of viability. Too many things were being released during too short of a window and it caused the players to flit gleefully between everything that was coming out. 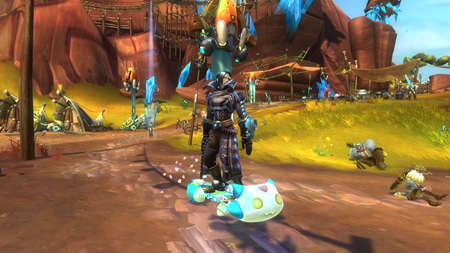 I know I personally left Elder Scrolls Online to play Wildstar and left Wildstar to play Warlords of Draenor. Sure I set down permanent roots in Final Fantasy XIV during that time as well… but most players do not do a great job of juggling more than one game at a time. More games have converted to the Free to Play model than I care to keep track of, and in no case has it really signaled a lasting doom for the community. If anything the opposite is true as a flood of new players come rushing into the community over a few months. When a game releases as free to play it becomes the shiny new thing in the view finder of the player base, and for a period of time everything old is new again. This is likely the phase of doom that most players are dreading, because it means that there will be more than a few “how I mine for fish” folks flooding into your gated community. The thing is… this too shall pass. Not all of these new people will stick around and find footing in the game, and often times the most heinous of players tend to be the most fickle as well. Within six months you will have a more stable population filled with the people who really do intend to set down roots in your community and stick around awhile. Many of those players will probably even convert to subscriptions, but simply didn’t want feeling like that was their only option. The free to play model is ultimately a good thing for many games because if nothing else it lowers the barrier of entry for new players. This makes it that much easier for you to be able to recruit people into the game to join you. I know with Final Fantasy XIV once they opened the fourteen day trial accounts, it became all that much easier to get my friends to give the game a “second glance”. This also means that probably every player that played at launch is going to fire the game back up and revisit their characters. I personally found the game greatly improved when coming back recently and rerolling as an Exile. I don’t regret my decision to come back, nor do I regret snapping up cheap boxed copies of the game for months of gametime and bonus items. The game is really rather good, and my hope is that with me stepping out of World of Warcraft for awhile I can devote more time to playing it. If you find yourself in a situation where you are surrounded by “doom and gloom” folks, my suggestion is that maybe you find a more friendly place to hang out. Over the long haul this will be a good thing for a game that was so desperately trying to avoid falling into a death spiral. Anyone saying that the age of the sub-based MMO is over is out of their minds, plain and simple. WoW, despite it’s subscription roller coaster, is still played by more people than any other MMO, ever. FFXIV has mounted a huge comeback in recent months, and is only getting better with the launch of Heavensward. EVE Online continues to be a solid, well loved game that isn’t going anywhere. That said, there are a lot of games out there that just aren’t cut out for the sub model. I feel like games that are grounded in well established IPs(Star Trek/Wars, LOTR) in particular will continue to do poorly subwise, since there are so many players who aren’t typical mmo players that will pick it up at some point nonetheless. I’d say that the same goes for games that are system clones or throwbacks to the old days as well; Wildstar and Darkfall would both fall into this category. But with all that said, when it comes to success of a game as it transitions, the key is ensuring that free players feel like they’re adding value to the game, and aren’t expected to be a cash spigot for the company. SWTOR was awful about this early on, and still isn’t great about it. But it’s gotten much better. Games like LotRO and Rift set an exceptional bar in this regard. You got it. F2P is not about encouraging people to buy, but about creating an environment that encourages them to buy.